We aim to minimise our impact on the environment through our tour operation and this is key on a trip such as this where we have come to enjoy the natural wonders of Canada. We and our suppliers work to the strict environmental guidelines laid out in our Responsible Tourism policy, governing how we observe wildlife, deal with waste and operate walks to minimise our impacts in the fragile national parks we are visiting. All leaders are trained in responsible tourism matters too and brief our groups on how they can mimimise their own impacts, avoid disturbing wildlife and foster a respect for the culture of indigenous communities. We spend a significant amount of time at various National Parks on this tour, the included entrance fees help to preserve the status and upkeep of the park on a continued and sustainable basis. Interaction with National Park Rangers helps to preserve this role as an employment opportunity for local people and future generations. Our Tour Leaders educate travelers on how best to interact with the wildlife in the parks, for example advising people not to feed the animals to stop them becoming dependent on hand-outs from humans. They will also advise all groups to keep to the path to avoid upsetting the balance of nature. As tap water is safe to drink in these areas, we urge you to take a water bottle to fill up, rather than generating plastic bottle waste. Whenever possible, we use small local accommodation, such as the Helmcken Falls Lodge at the entrance to the Wells Gray Provincial Park, and locally owned activity providers. We shop at local stores for picnic items, and our Tour Leaders will encourage us to eat in family-run restaurants and visit local shops whenever possible. This all brings economic benefit to the local communities that we visit. 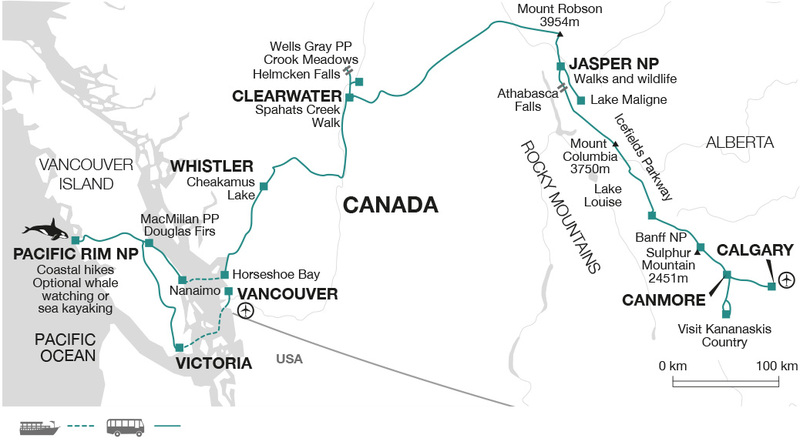 Our Tour Leader is Canadian, and will guide us through the National Parks that they know so well. We travel in small groups of 12-13 people to minimise the effects that large groups have when visiting remote areas and small villages. This allows us to stay in smaller properties and eat in more local establishments, while larger coachloads of 40-50 would need to eat in more touristy places.